ARENACLEAR – Dust & Mud control – Quart size container treats 2,500 sq. ft. Works on both indoor & outdoor arenas. 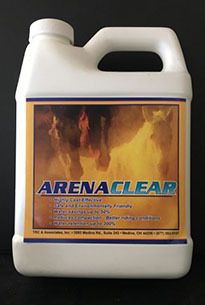 ARENACLEAR Dust & Mud control – Treats 2,500 – 3,000 sq. ft. of indoor & outdoor arenas, paddocks, run-ins, small areas for mud,etc. Reduces the need to purchase a full gallon if you only have a small area. One application lasts at least a year.